Is there anything more warm and wonderful than a steaming hot bowl of homemade tomato soup and a crispy gooey grilled cheese sandwich? That combo belongs in the Lunchtime Hall Of Fame, and the only possible improvement I can think of is to have the grilled cheese sandwich actually floating in the soup. So you don’t have to pick – you can have a spoonful that has BOTH. Both is good. Both is delicious! I realize that I am probably the 1,000,000th person to have this revelation, so if I am telling you something you already know, please ignore me and go back to your bowl of tomato soup with grilled cheese sandwich croutons. But on the off-chance that there is anyone else out there who hasn’t had this lightbulb go off in their head, I’m here to tell you that late is definitely better than never. I’m also here to tell you that tempting as it might be to run for that can of Campbells, homemade tomato soup is SO much better and not that hard. And crispy gooey grilled cheese croutons deserve really great soup. 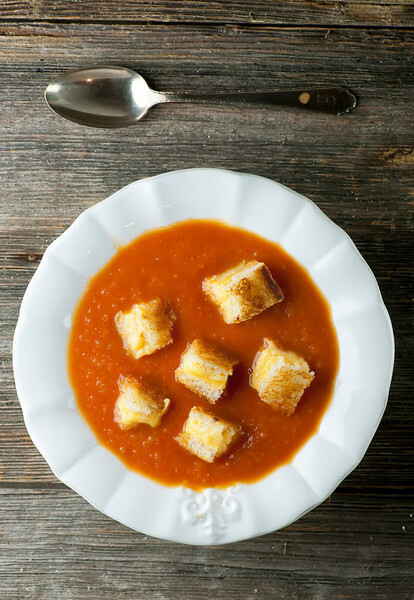 …make yourself a lunchtime treat of homemade tomato soup with grilled cheese croutons. I insist! 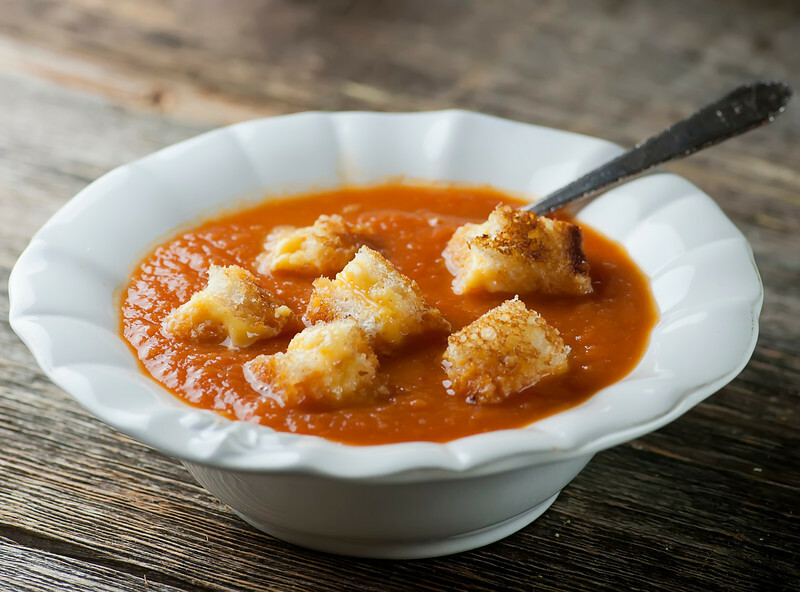 You could have tomato soup with a grilled cheese sandwich…or you could have it all at once with this recipe for tomato soup with grilled cheese croutons! Heat 2 tablespoons olive oil in saucepan over medium heat. Add red pepper flakes, garlic and onion and cook, stirring, about 6 minutes or until onions are tender. Add tomatoes and chicken stock and bring to a boil, then reduce heat to a simmer and cook for 30 minutes, stirring occasionally. Puree in blender (or with immersion blender) until smooth and season to taste with salt and pepper. Return to pot and keep warm while you make the sandwiches. Butter two slices of bread. Put cheese in between slices and cook in skillet until deep golden brown on each side. Cool slightly, then cut into crouton-sized cubes. Ladle soup into bowls and float croutons on top. Serve at once. Yes, please!! This would be perfect for my lunch today, on this subzero Michigan day! Yum! I will be trying this one, but I will be using cheddar instead of American cheese. Cheddar will give it a nice snappy tang! sounds Delish ! No Campbell’s soup here! love the take on the croutons.. pure yumminess! 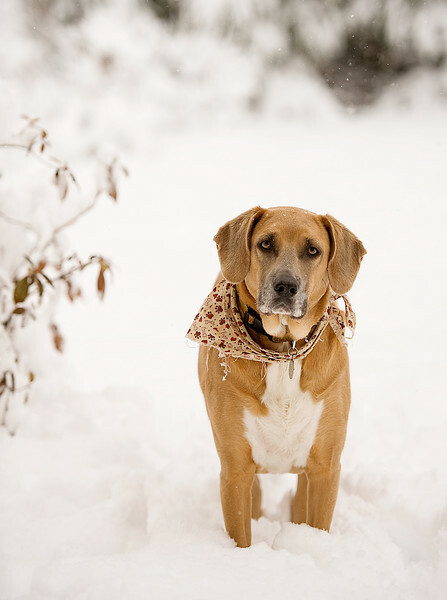 Boy, would I like to mail you some of our snow and ice! Hang in there! I have heard of this concept, but I can always stand to be reminded of it! Totally craving a bowl now! YUM! I make something similar to this with grilled cheese croutons, but it’s the Campbell’s Tomato Soup knockoff. I love how tomatoey (totally a word) your soup looks! And the grilled cheese croutons are awesome. We love them because you get soup and sandwich in every bite. I never thought of putting a grilled cheese sandwich right in the soup and will be trying it out tomorrow. Thanks. Try my quicker (New Mexican) version. Sizzle 1 T. masa harina in 1 T butter just till starting to brown. Add 2 or 3 cups tomato juice (or V-8) and a large spoonful of fresh salsa. (Hot or mild—your choice) Bring to simmer. Puree with immersion blender. Simmer till slightly thickened by the masa harina. Taste for salt and pepper. Very cool variation…will definitely try!